Yesterdat Nifty broke out of all nearby resistances. This is a bullish sign on few days to come. Bull markets typically pass through cycles of consolidation and correction. Gabriel India Ltd chart is currently experiencing one such consolidation. When the rallies are larger, the consolidation periods also last long. 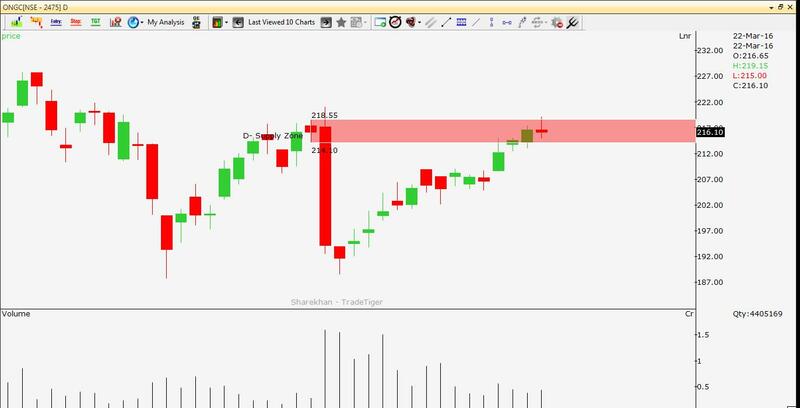 Gabriel had broken out of trading range earlier in May 2014. This is when major Indices in India experienced sudden rally after Modi Govt. elected to power. 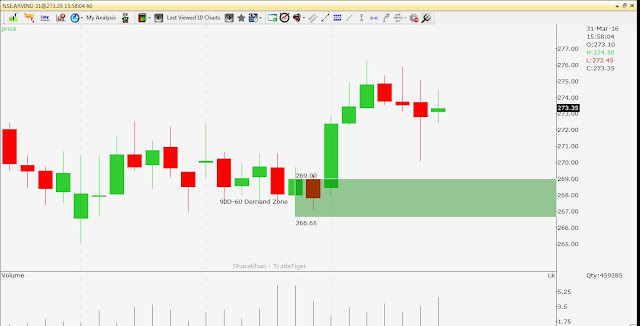 As you can see from Gabriel chart enclosed it also broke out of trading range to reach to price of 106 in a period of 9 months. It posted life time high of 106.75 in Jan 2015. After this, the next consolidation phase started. 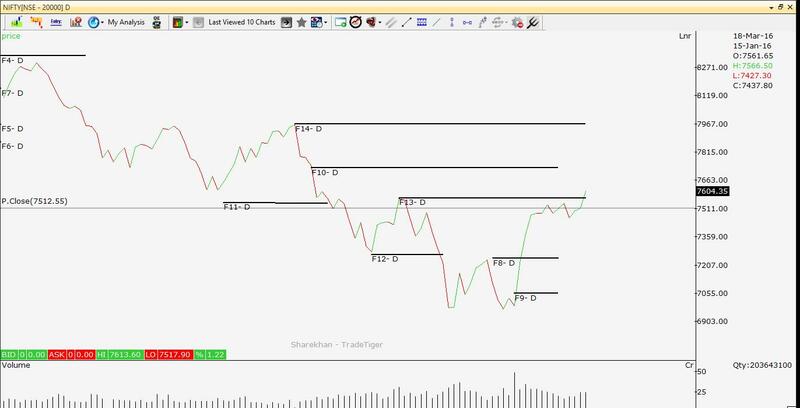 Chart is trading in a range since then. 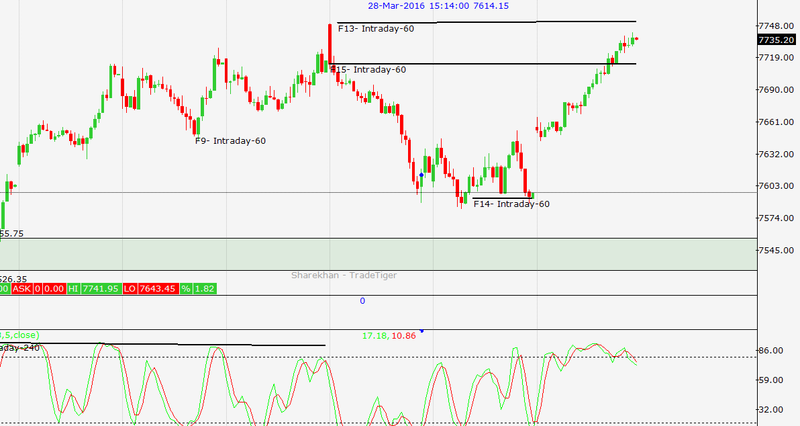 Its been more than a year now and the trading range is getting narrower. We do not know how long the consolidation will last. However, an upward breakout of this consolidation can start next phase of rally in Gabriel. This anticipated breakout can form a 'Up Flag' pattern. Target for up flag is equal to range of earlier rally known as 'pole' which can be seen from weekly chart enclosed with this article. 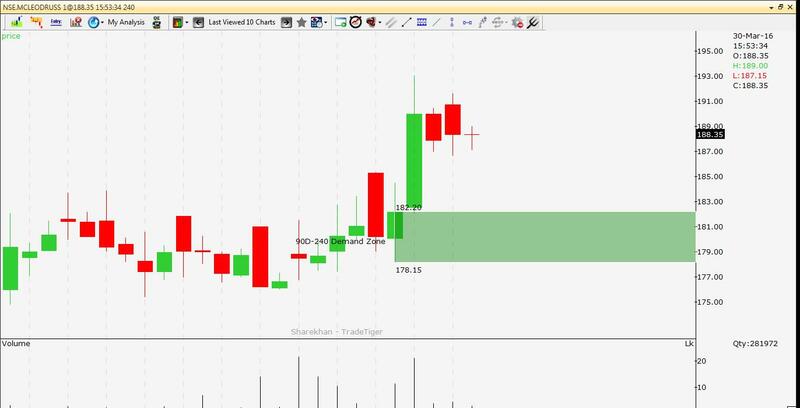 In this case pole started on 30 Aug 13 and formation ended on 30 Jan 15. The range for this pole is 90 points. Add 90 points to base price of Flag. The base of Flag in this case is near 75. So, one can expect Gabriel, if breaks out of this consolidation, to gun for a target of 165. If you are a medium term trader Gabriel can be a good stuff to be in your portfolio. Fundamentally stock is placed in a good position with no debts, increasing sales and profit margins. Last 4 days to subscribe at a discount of 40% as the prices are increasing from 1 Apr. 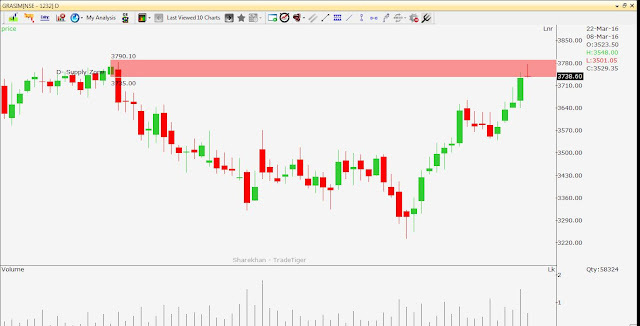 Read on this view to understand how to trade expiry week. As mentioned in this newsletter last week Nifty paused at resistance of 7720. The small week is over. Nothing much last week. Bulls and bears- both were in holiday mood. World markets traded in narrow range with mixed cues. So how to trade this expiry week? 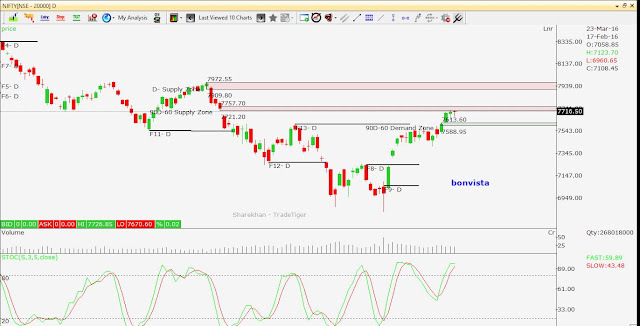 Technical Overview: Last week Nifty made a high of 7728 and low of 7617 to close at 7716. It was narrow range of 111 points forming green candle. 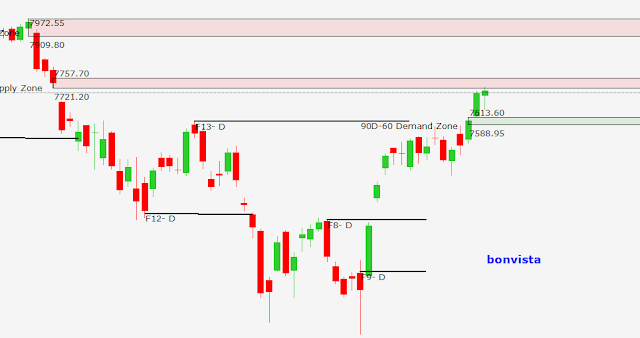 The resistance at 7720 is still held by Nifty. 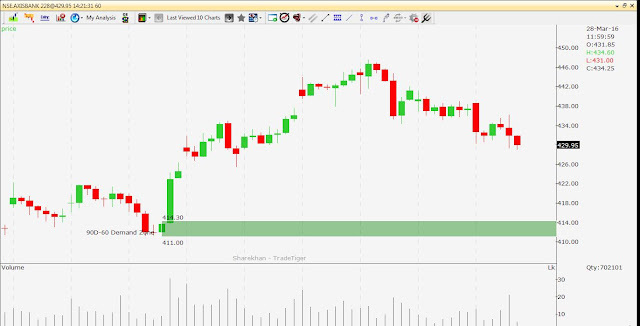 Hanging man on daily chart near this resistance indicates pressure on the move further up. However the trend is still up. No indications for shorts so far. 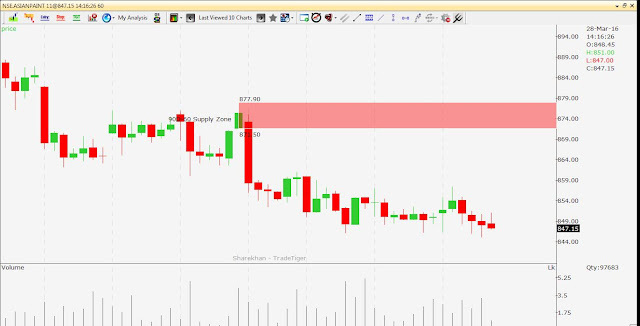 Longs can be created on dip near 7610-7650 or on a breakout beyond 7760. My View: We are into expiry week. As is the case with most expiry periods- expect markets to trade choppy this week too. On a shorter time frame (hourly), Nifty is making is sideways move. This sideways trading range needs to be broken either side. 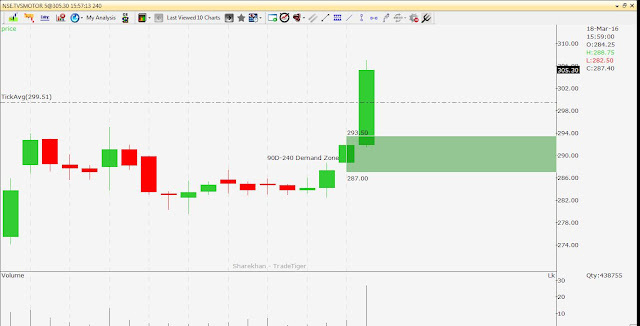 For next couple of sessions best trade is not trade. Wait for Nifty to give clear indication to create fresh long near support on breakout. Note: Do not consider these as buy or sell recommendations. 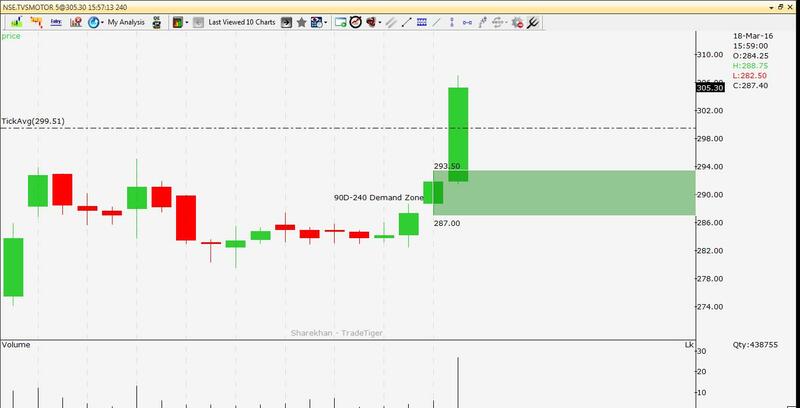 Yesterday Nifty gained in last hour of trade. However bulls are exhausting at this stage. A Hanging Man pattern on daily chart yesterday confirming to bull exhaustion. Nifty is trading in overbaught zone near a resistance. The resistance zone is 7720-7760. If Nifty takes out 7760 convincingly then next target would be 7900. However lacking momentum, trade in overoguht zone, forthcoming holidays can be some hurdles for bulls to push Nifty to gain further. Expect lacklustre trade with negative bias on Nifty today. If Nifty breaks below 7643, expect further donwside to 7610 which is a support. In this newsletter read whether current move on Nifty is giving us an indication of new uptrend. Last week was consecutive third week of markets closing in green. Fierce bulls are not giving up the battle. World markets too traded with good stability. 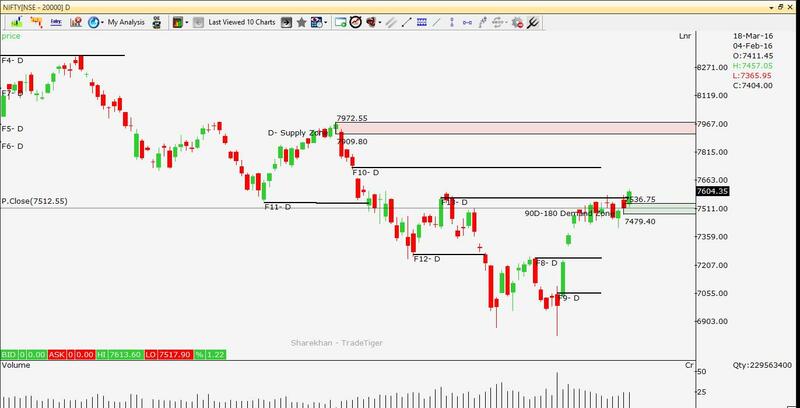 Is this a confirmation of new uptrend on Nifty? 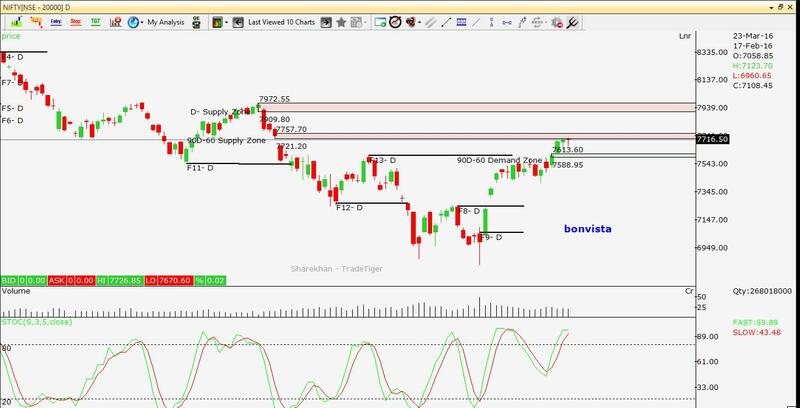 Technical Overview: Last week Nifty made a high of 7613 and low of 7405 to close at 7604. Markets closed near high of last week. I had mentioned about resistance near 7600 in last newsletter. Nifty broke out of this resistance to close above 7600. That makes Nifty's way clear to its next destination at 7720. As Nifty has its next resistance at 7720. Charts clearly shows downtrend and uptrend cycles. 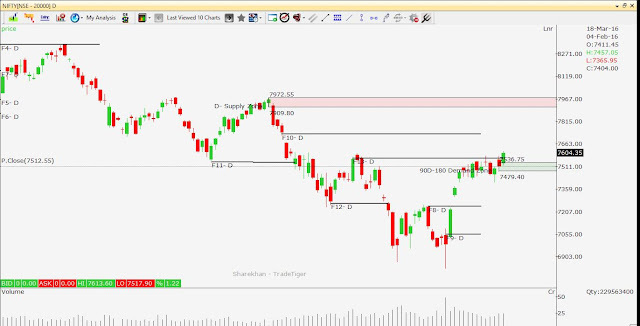 Nifty chart is in the process of changing from downtrend to uptrend. As you can see cycle of Lower Top Lower Bottom (LTLB) is getting changed into cycle of Higher Top Higher Bottom(HTHB). This change of cycle is more clearly seen on line chart- hence here I am attaching the line chart as well. My View: You can see from the line chart attached with this article that LTLB cycle is changing to cycle of HTHB. This is early sign of medium term trend reversal. This market has turned to buy on dips market- unless some unexpected event comes in. No more shorts (sell) in this type of market. Long and medium term investors- many fundamentally good stocks are available at technically right price. Time to enter into markets. Don’t be fearful now- time to get greedy. How have we done during the fall of last one year? I have a long only Product Prime Cash. In this product I buy stocks with potentially fast movement over medium term to earn quick gains. A portfolio with strict discipline has made 31.7% excluding brokerage (Rs 63500 on investment of Rs 200000) in last one year. You know how market has fallen over last one year. In-spite of this fall Prime Cas portfolio had 3 positive quarters and cumulative returns of over 31%. If you are a medium term trader and want safe portfolio- this one is for you. Yearly Subscription charges are increasing from Rs 5000 to Rs 8000 from 1st Apr. It means subscription is available at discount of 37.5% now. When is it most likely that your stops are hit ! !